This morning I started a new painting, which I'm calling Green Tilt; it's a 10 x 24 inch horizontal; the gouache study done on site is above. I found the three major colors in the image very appealing, with the cool colors of blue and green against the warmth of the red-brown rusts. A major shift for me in this painting is that there is no direct sunlight playing across the surface, something that has always been a major part of composing for me. I like having cast shadows as compositional elements, and sunlight adds vibrant color variations in reflected and direct light. But there I was, standing in front of a motif that I liked a lot, and there was no sun. So this painting will be an attempt to work with a different kind of light, one that is softer and in a sense more embedded in the forms. I wonder if this will make the work more abstract, since we are not shown a real world sunlight. Above is the first layer of paint applied to the panel, on top of an ink drawing. I wanted to photograph this early stage of work to illustrate some of the wonderful qualities of egg tempera: its translucency, quick drying, ease of handling, vivid color. 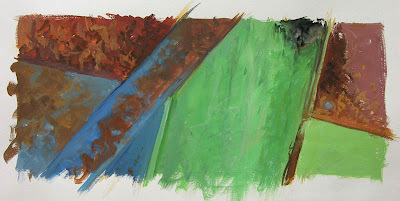 It doesn't yet look as rich as the gouache study, but that's because tempera does require layers of paint to achieve its full intensity of color. One thing I wanted to point out was that when white is added to the color, the paint becomes more opaque and this is clearly seen above. This opacity is very useful as I develop the painting. Please click on the image (even those of you reading this in an email subscription can do this; the enlargements are always embedded in the emails) to see this more clearly. I'm looking forward to the challenge of picturing what is essentially a flat image, having only a shallow space. As I look out my windows in recent days, I've seen the landscape change color in its inexorable movement towards winter. There's some deep reddish-brown in the beech trees and yellow in the tamaracks, but soon all will be dun-colored, the grayish brown of winter, made exciting again by the contrast with fallen snow. 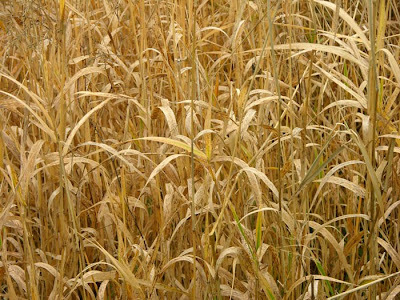 Against this dulling landscape, the color of dried grasses becomes vibrant. 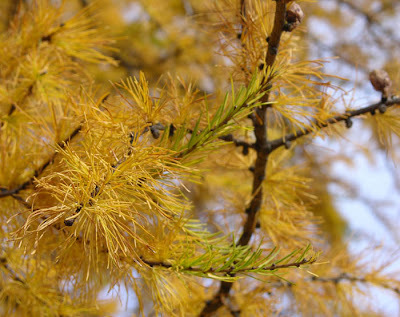 The pale brownish-yellow of the brittle leaves and stems glistens even under the day's gloomy skies. 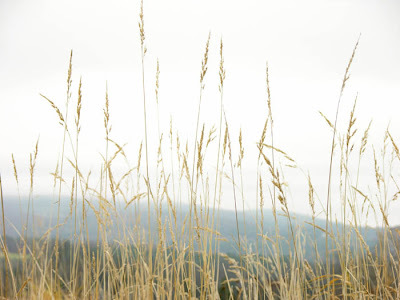 When I see the five foot tall seed heads against the sky, I can't help but think of the Great Plains, where the original tall grass prairies stretched for hundreds of miles, and were taller than a man on horseback, a sight both stark and fecund, and overpowering. I finished this small painting yesterday, after adjusting the color many times on the yellow sections of the hose (that's what the yellow and black is, a large hose on an agricultural implement). I had to go back and forth from lighter to darker colors in order to get a sense of light flowing through the material. Because the panels are very small, getting the brushwork to be both descriptive and lively was fairly difficult. I have mixed feelings about this work. It's impossible to see online, since all images big or small are reduced to the same format, but I think this might have been better on larger sized panels. When I paint studies from the motif, I usually make the work about life size, even taking out my ruler to measure the thing I'm painting. But this work looks a bit cramped to me, and too fussy. The painting is now sitting on a shelf alongside Opposing Angles and looks better there than it did upstairs in the studio. 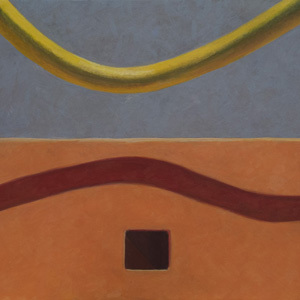 I expressed misgivings about a painting before––Yellow Curve––which I've come to like after living with it for a while, so my opinion of this work may shift. It's odd to be thinking about spring now, as we're heading into winter, but I look forward to the season of outdoor painting to see where my eye may lead. I've lately felt most interested in the simplest compositions and so might choose even more abstract images when I go out to paint studies. Having to write about my working process has certainly nudged me to be even more conscious of my thoughts, which for me is a good thing. I believe that clarity in thinking promotes better and more interesting painting. 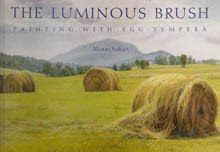 Painting with egg tempera requires working on a hard surface; tempera requires an absorbent ground which traditional gesso provides; the gesso is brittle and would crack on a flexible support like canvas. So I have a friend who is a former cabinetmaker build these panels for me in the sizes I require. The surface is medium density fiberboard which is cradled on the back to keep the panel flat. 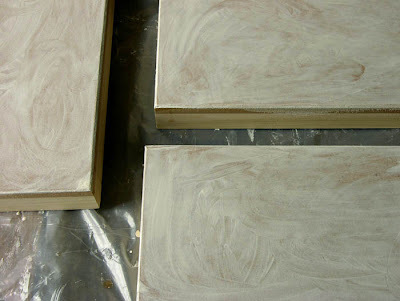 Last night I sized the panels with a solution of food grade gelatin and water in preparation for the gesso today. Many painters use rabbit skin glue, which also works well, but I find the gelatin works well and is easy to store and measure. I prepare a few panels at a time, unless I have a very large one. 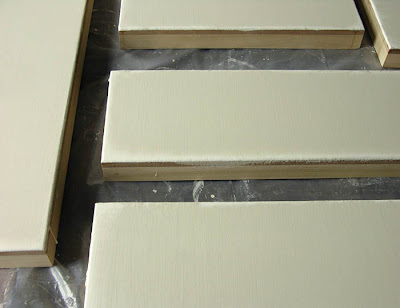 Above is the first coat of gesso, made with the gelatin size mixed with chalk. I usually rub the first coat with my fingers to spread it and remove any air bubbles. Subsequent coats are carefully painted on with a wide brush. The gesso coat is allowed to dry between coats only till the shine is gone from the surface, which can take from 15 minutes to an hour or so. When I have the woodstove going, on a day like today, the room is very warm and dry so the process goes more quickly than it would during a humid summer day. I put 6 or 7 coats of gesso on the panels; it has to be thick enough to leave plenty of material after the panels are sanded smooth. 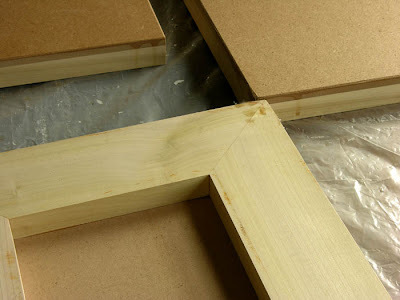 After sanding, the painting surface is silky smooth, with a luscious sensuous feel. Working with egg tempera requires some preparation of panels and pigment, but this enriches the entire painting process; I am physically engaged with the panels and see pigments in their powdered form before they become paint. This making-by-hand of the elements of a painting, which is itself a very hand made object, seems almost medieval. I love these jarring inconsistencies: blogging about traditional pursuits, painting machinery using an ancient medium. Leeks are one of the late season vegetables, still coming from the garden, that are such a pleasure to eat at this time of year. My favorite way of preparing them is braising, and is very simple and quick. 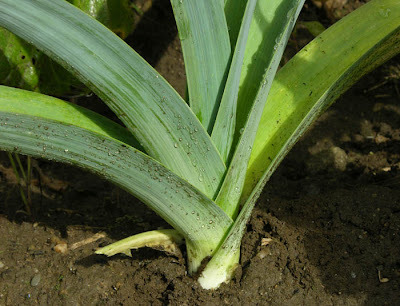 Use the white part of the leek, with a bit of green at the top (for some reason, my leeks are a bit green inside this year). 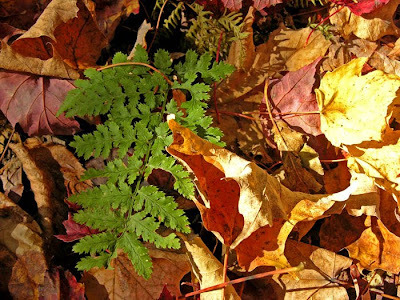 Cut in half lengthwise and clean any dirt that may be hiding between the leaves. Place the leeks in a wide pan with some butter––I used a tablespoon for 3 leeks––a bit of salt, and barely cover with water. Bring to a boil, covered, and cook till leeks are tender; then remove cover and let water boil off, allowing leeks to lightly brown. 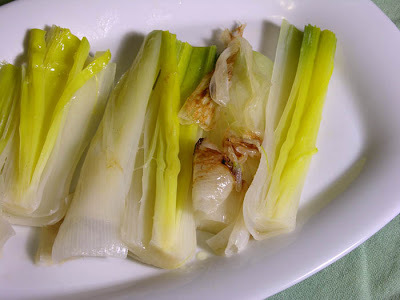 I ate leeks for dinner last night, along with some boiled potatoes. This may sound very ordinary, but my feeling about this meal is similar to that described in the post "A Fall Meal" in its seasonable perfection. The potato variety that I cooked is called French Fingerling, a creamy, moist, incredibly flavorful tuber that is by far the most delicious boiled potato I've ever eaten. If you've never experienced the taste of a home grown potato, you're missing something wonderful. 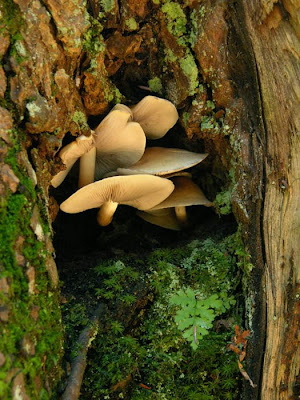 Three days ago, I noticed a few small mushrooms crowded into the crotch of a tree stump. When I passed the same spot yesterday, there were suddenly scores of little brownish caps surrounding the stump, from teeny ones just emerged to the largest of one to two inches. 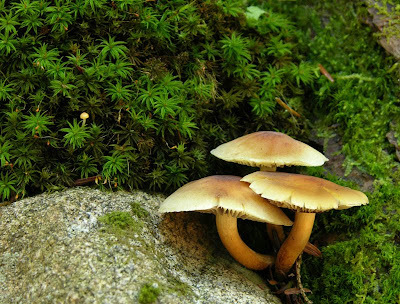 They were nestled in vivid green moss, growing on dead wood. In their magical-seeming emergence, I can understand why mushrooms are so prevalent in folklore; they look to be perfect companions for elves and fairies. Today the mushrooms were almost all gone. Deer tracks near the spot told the story. 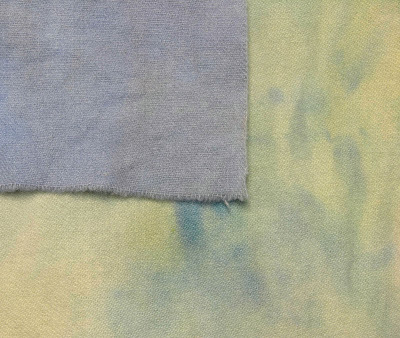 I've begun work on the diptych Floating Squares and wanted to show the results of the dyeing process for this piece. My idea for the background was to have softly variegated coloration, picking up on the colors of the two squares, green and blue, with the addition of a pale yellow. In order to dye the wool this way, I scrunch it into a flat pan and drop color by the spoonful here and there; this creates a random pattern of mixed colors and values. 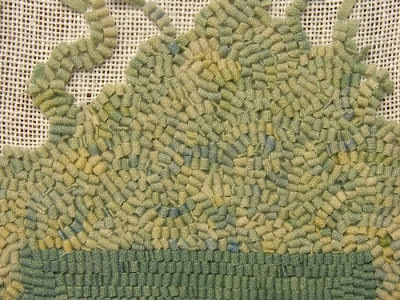 The detail of the ruglet above shows how this fabric looks when it is hooked. Below is the blue wool for the other square, with its background fabric. I had found a piece of light blue wool in my remnants pile that seemed perfect for this piece; when I dyed the green, I found that the blue was too clear and bright a blue so I overdyed it with a tiny amount of light orange to dull it a bit (blue and orange are color complements, so can gray each other). This worked perfectly and the green and blue squares will now be in balance. Today has been a lovely fall day, with lots of bright sun. I've been doing a bit of yardwork, including raking the leaves from the only tree near my house, a White Ash I planted when I moved here 20 years ago. 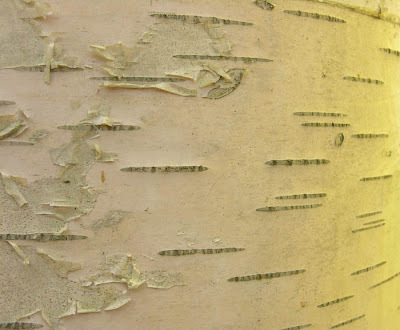 Like many Vermonters, the previous owner (the same family since the house was built in 1821) felt that having trees near a house was asking for trouble. But this tree has grown into a lovely shade-producing leafy shelter for warm summer days. 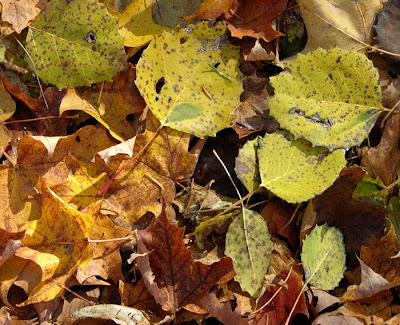 Raking browned leaves brought thoughts of the paths in the woods which had been brightly colored several days ago. 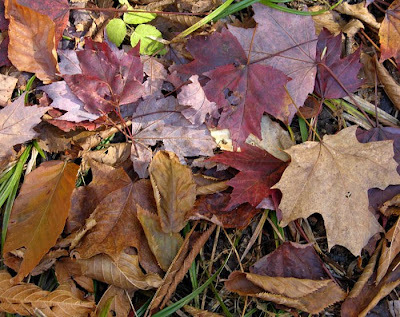 Time, and soaking rain, have softened the hues of the fallen leaves; the bright reds are deepening to burgundy or fading to brown. 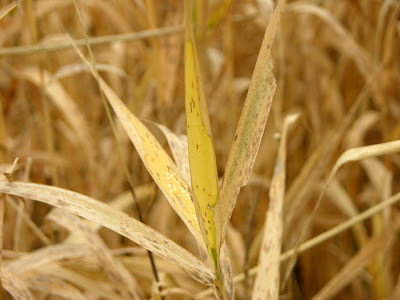 There are still splashes of green and yellow, but the predominant hues are tans and browns and ochres. Colors are rich and lovely even within this limited and subtle range. We are adjusting to the color changes surrounding us and preparing for the stern beauty of winter. When I first began work on this painting, I was concerned that I might not enjoy it, considering the amount of detail compared to the three works most recently completed. But as I've been chugging along with the work, I've adjusted to the smaller size––these panels are just six inches square––and more detailed forms. Using a smaller brush, and a more limited motion––of fingers to wrist rather than wrist to arm––I can have the same amount of play in the mark making as on a larger panel. I am so aware of the painting as an object when working on something of this size; it is not just a representation, but a small yet hefty thing. What you see here is the painting after getting the drawing closer to correct (though the stripes on the right have to be redrawn; the curve is too exaggerated). 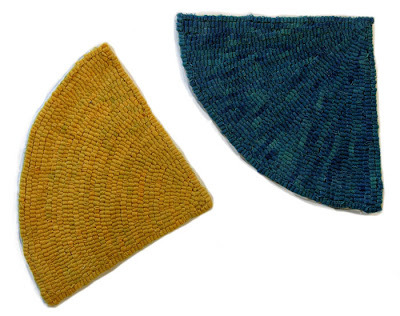 The color I've laid down is a lighter value than it will finally be, especially in the yellows. Glazing a darker color over the light will give an illusion of light coming through the empty hose. It's a challenge to describe in paint the variety of materials and surfaces of the subject; it's a delight when I come close to achieving it. 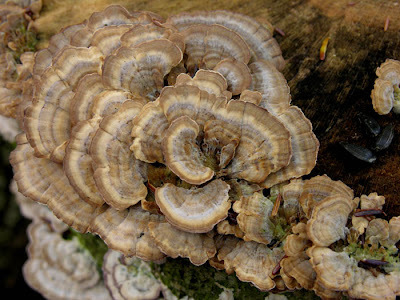 Mushrooms are a marvel in their diversity of color and shape and size. This beautiful grouping was growing on the stump of a tree. Its subtly variegated bands of color create an outwardly flowing pattern, as though seen undulating under water. I'm unable to name these mushrooms, not being a mycologist, or naturalist of any sort. Perhaps a knowledgeable reader can name them for us. 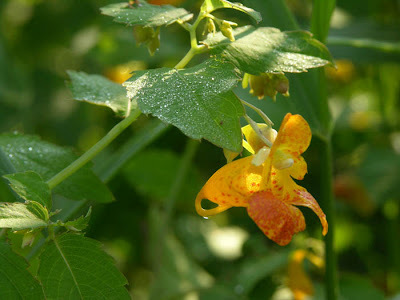 Why is it so satisfying to learn the name of an unknown species? do we somehow feel we then have a more perfect understanding? Today is a rainy, gloomy day, the sort of day when Blinky the cat prefers lying next to the warm woodstove to gallivanting outdoors. But yesterday was lovely, mildish with filtered sun. 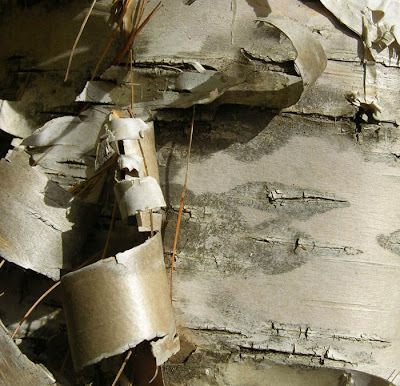 On my woodland walks I'd been noticing the interesting variations in the bark of birch trees, with their markings and papery peelings. 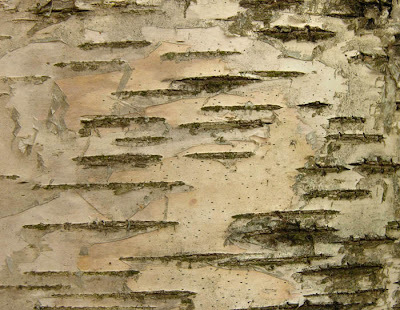 The dark striations appear mysterious, almost like runes, a secret language crossing the trunk. 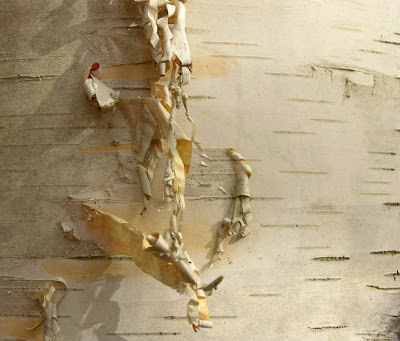 The peelings create meandering forms, delicate or bold, catching the light in sculptural play. In my post "A Walk in the Woods", I touched on my desire to gather images and that painting, rug hooking, and photography all satisfied that desire, but in different ways. I'd like to expand on that idea and tease out more of the meaning of each for me. I'm sure that those of you who work with more than one medium notice that each process engages the mind or body differently. I am primarily a painter, having put paint to canvas or board for over 40 years. If I don't paint for a few days, I get itchy, wanting to work, sometimes for the simply pleasurable sensation of working a brush over a surface. There is also the deep satisfaction of creating an image, one that convinces the viewer and has a tactile presence. As years have gone by, this "making" of a thing has become more important to me; previously, my landscape work was more visual, an illusion of deep space. 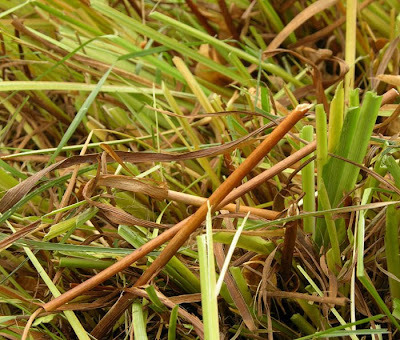 What has remained constant for many years is the meaning I attach to farming subjects; agriculture is an essential activity that is sometimes destructive; it is noble, endangered, and hopeless. These thoughts are important in motivating my work; I wouldn't want to paint details of carnival rides, however colorful. Except for a few brief forays into abstract painting, I've always worked with images. But I love abstract painting, especially minimalism. 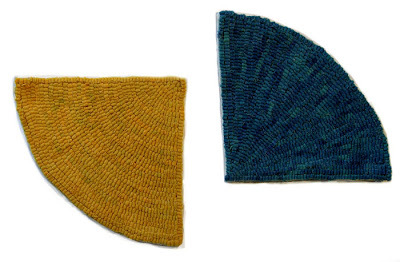 When I started making hooked rugs in 2005, my idea was to have a few handmade floor coverings, but it soon became evident to me that this medium was ideal to explore my interest in abstraction. Because it was new to me, it didn't carry years of experience in a representational style as painting did. 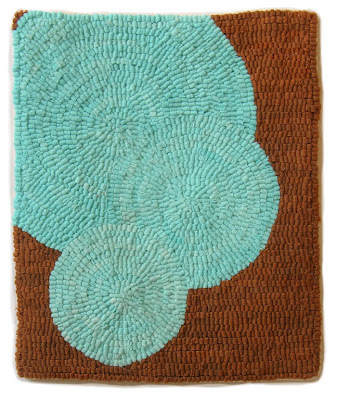 A hooked rug's marvelous colors and textures allowed for play within simple shapes. I was able to honor, by imitating yet changing, many of my favorite paintings. When I'm painting, I have to devote my full attention to it (except for the radio, playing in the background). Hooking a ruglet, once the design is drawn onto the backing, is relaxing handwork, which I'm able to do while watching tv in the evening. There is something almost sculptural about a finished ruglet; our experience of it is very sensual. For me there's less of intellect and more of direct line-shape-color than in painting. 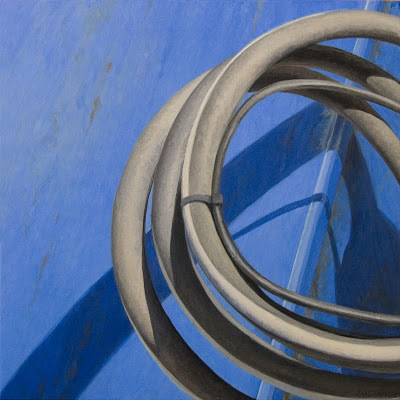 My years of hooking have truly influenced my paintings, though, as they give me a clearer way towards abstraction. See a wall of ruglets here, and the later paintings here. When I was an art student, I took a photography class before I learned painting; sometimes I think that my method for composing paintings was fixed by this first contact with a camera and its limiting viewfinder. For many years, I used photography as only a drawing aid for my paintings, an easy way to record details for later studio work. For a short while I had a small photo business, making cards and prints of still life. I loved composing and shooting the objects and the light, loved the challenge of creating variations within the same format. For me, time is a distinguishing feature of photography, in that I am capturing a moment. The study for a painting is done over the period of an hour or so, with the light being a composite of what I saw; the making of the work takes hours more, and that time is inherent in how we look at painting. Rug hooking is also a lengthy process. When I take a photo, it is a record of a moment, carefully composed to be as expressive and beautiful as possible. My camera is my eye saying "look at this wonderful thing". This is an immediate pleasure that has become a necessary activity for me in my daily life. And finally, I'd like to say a word about writing, since it's an essential part of this blog. For most of my life I felt I couldn't write, then in the late 90s I was asked to write a short piece about my work. I found that I loved crafting words, that it was almost a physical pleasure, certainly a mental one. Words are a essential part of the making of this blog, adding content and complexity to images. 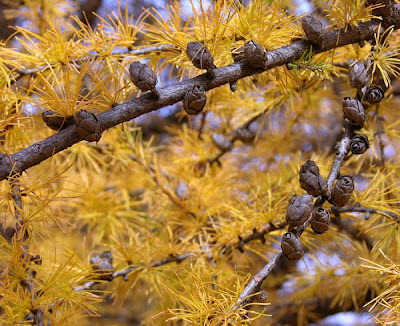 Tamaracks are a surprising tree; they are conifers, producing delicate small 1/2 inch cones looking like tiny rosebuds; they are also deciduous, their slender needles turning deep yellow in later fall, and then dropping. I don't know of any other conifer that does this. They are beautiful to see at this time of year, a golden haze of shimmering light. I've been slowly, bit by bit, getting my perennial borders ready for winter. I cut the plants back, as the siberian irises above, edge the borders, and do some weeding. With all the cold weather we've been having, I'm behind on this chore, since it's not at all pleasant to work outdoors in nasty weather. But some plants still show color in their leaves and seeds, so I've held off from cutting them. 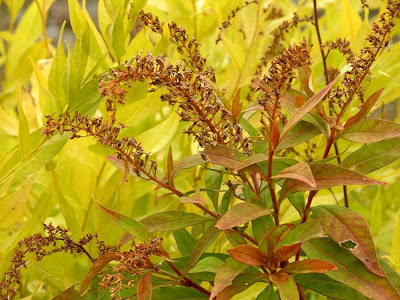 I can still look out the window and see the yellow green leaves of amsonia and the reddish leaves and seedheads of a large astilbe. Two huge clumps of siberian iris are still a bright warm yellow green; when they start to brown, I'll cut them. 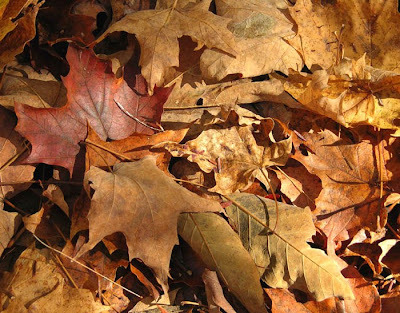 For now, I can peer around my computer, into the back garden and up my neighbor's hill, and see the subtle colors of late fall––deep yellows, dark ochres, and browning reds––against the fresh green of lawns renewed by recent rains. 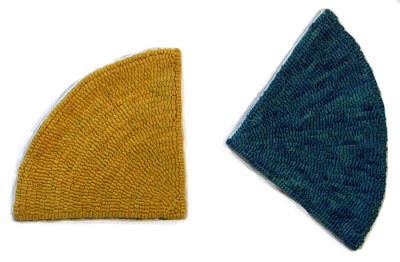 A New Rug Hooking Project, "Floating Squares", Inspired by Watching Ozu's "Late Autumn"
The films of Yasujiro Ozu are visually stunning, each scene composed with the close attention to detail of a still life painter. The camera is always at a low level, so that we are looking up at the characters, and is fixed. If an empty interior is presented, we then see a figure move across the hall, into a hidden room on the right, then back into the frame, moving naturally through the visible space. 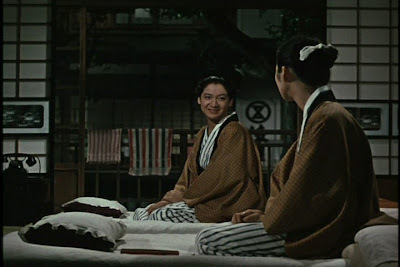 Each scene is built of clear horizontal and vertical elements, receding in orderly planes. 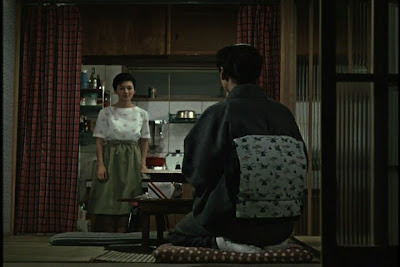 Before seeing Late Autumn, a film made in 1960, all the Ozu works I knew were in black and white, so watching this stunning work was a revelation. 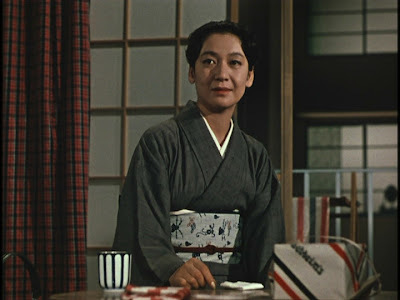 I'd never seen a film so consciously composed with color elements: the red repeating the red, the stripes picked up horizontally and vertically, a scene in warm tones or cool. This formal feast is on top of the sensitive, gentle explorations of character, of family and friendship. 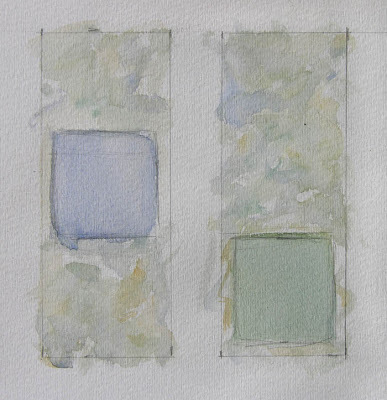 In one scene, I saw a pair of hanging scrolls, each with a plain square in the center. The proportion of long narrow rectangle with a simple square appealed to me. Instead of placing the two squares in the center, I'm aligning the lower edge of the left with the upper of the right, creating a more dynamic relationship. This work will be a diptych, each part being 20 inches by 8 inches. I dyed the background color by using a spot dyeing technique: dropping color (the two colors of the squares, plus a light ochre/yellow) by spoonsful on fabric bunched in a tray. When hooked, it will give a random color effect. I'm hoping the squares will indeed seem to be floating within their airy confines. 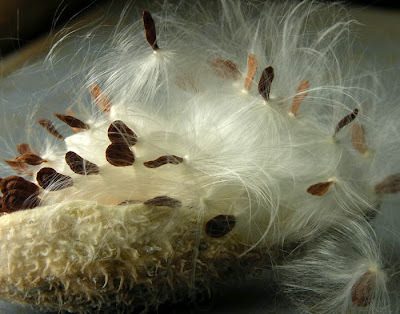 When I photographed milkweed a few days ago, I didn't realize that the seeds in the pods pictured were immature. Yesterday I noticed that each of the larger seeds, a flat oval shape, had a circular gathering of tiny threads on its end. This lovely billowing form carries the seed on the wind. 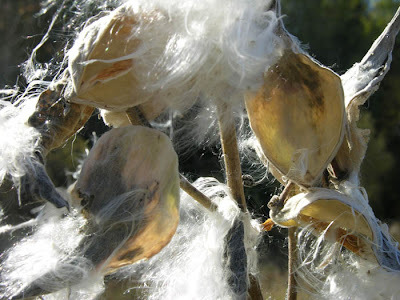 Milkweed silk, I discovered, was used to fill jackets during World War II and is still used to fill some natural fiber pillows. On Sunday, I went to a meeting of my art group, a several-time-a-year gathering of artist and writer friends, and took a pumpkin puree and some of my homemade sourdough bread for the potluck. The recipe is from Mediterranean Cookery, now out of print, by Claudia Roden, one of my favorite cookbook writers. 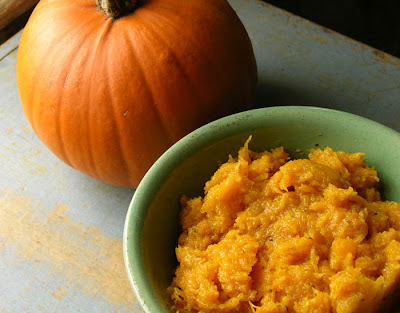 This is a way of using pumpkin that isn't sweet, but is a savory appetizer and is very good heaped on bread. Cut the pumpkin in half and scrape out seeds and fibers. Cut in large pieces and steam till tender, about 20 to 30 minutes. Remove flesh from skin, place in bowl and mash with potato masher. Stir in the remaining ingredients. Study for "Ochre and Black Stripes"
Today I started work on a diptych which will be composed of two six inch square panels. I began painting in this format last winter, inspired by my hooked rugs, some of which are diptychs and multi-part pieces. The four egg temperas that I completed are posted here. I like engaging in a format that carries an image into a relationship with another; they can have the same color and essentially the same forms, but the differences create a lively dialogue. It's basically a formal conversation: shape balancing/pushing against shape, color leaping from one side to the other, line continuing or being broken. Each panel is enhanced by the other, not quite complete without its mate. 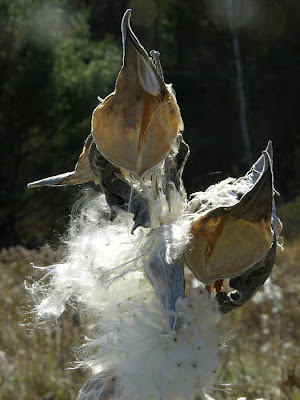 I was returning from my midday walk on this brilliantly clear day and noticed that in the field alongside the barn, the milkweed silks were glittering like so many puffs of pure light. The pods were open, allowing the silk to blow in the light wind, its small seeds ready to scatter. Part of my life in northern Vermont is my almost-daily walk through woods near my home. Although this landscape is not my garden, the quotidian observation is similar to that I experience with flowers, fruit and vegetables. 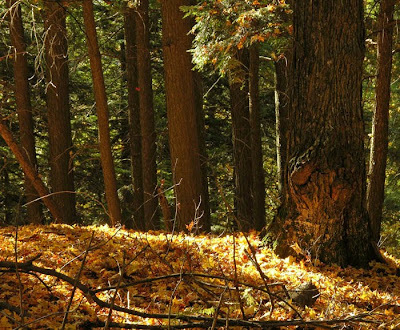 There are two walks that I take, one that has a small, intimate trail and another that is a longer trek, on a logging trail through the woods. Seeing the same land day after day is never boring; there's always something new to see, or feel. Yesterday was the only sunny day in quite a while; with the yellow leaves reflecting raking golden light up towards tree trunks, there was a brilliant passing effect, one that Monet might have been interested in capturing. A few days ago, a mass of dark mushrooms popped up in the middle of the trail; from a distance it looked like a large rock had rolled and settled there. This image prompted me to carry my camera yesterday, but when I got to the spot, the mushrooms were gone, having been completely eaten by a woodland creature, likely a deer. 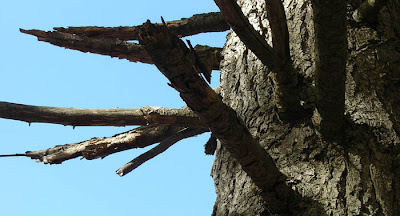 But there were other things I saw that I wanted to photograph, such as the dead tree with its broken branches scratching the sky, an aggressively expressive sight. As I've photographed over the past couple of months, I've become almost addicted to the process of framing an object, with its light, and re-presenting it on this blog. The way I see the world through my painting, which is primarily in close-up, has influenced the way I shoot pictures. But photograhing is very different from making a painting, and yet again different from working on a design for a hooked rug. Each medium, each way of seeing, influences and enriches the other. The woods walk is full of images, which will change through seasons, so calls for a continuing series. I've had a craving for an afternoon sweet for the past couple of weeks. I'm usually satisfied with a cup of tea or coffee and a piece of fruit, but the sudden cold weather has made me long for sugar. 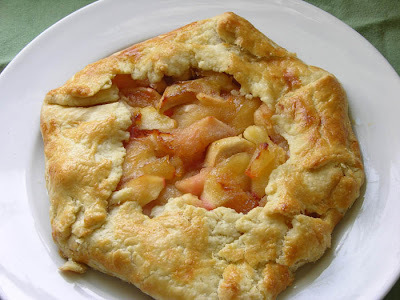 A friend commented to me that I should write about some sweets and mentioned patee brisee, which reminded me of a recipe I used to make: Tartelette aux Pommes Lionel Poilane. I think I got the recipe from the NY Times years ago. I just made the tart, and it's so delicious that I ate 1/3 of it. It's loaded with butter, which of course is why it's so good. The final pastry is about 8 to 9 inches in diameter. 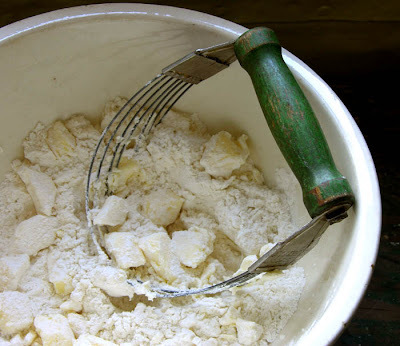 Put the flour, butter, sugar and salt into a bowl. The photo above shows a favorite old kitchen tool of mine, which is for cutting butter into flour. It works wonderfully well. My usual procedure is to cut the butter into small pieces with the tool, then switch to fingers, the best tool of all. Rub the butter into small bits in the flour, till it's like a very coarse meal (too fine and the dough won't be flaky enough). Add the water a tablespoon at a time, tossing it with cupped fingers, till all is damp and holds together. Flatten dough into a circle on a sheet of waxed paper and refrigerate for at least an hour. Roll the dough into a 12 inch circle, place on a cookie sheet and refrigerate while cooking the apples. 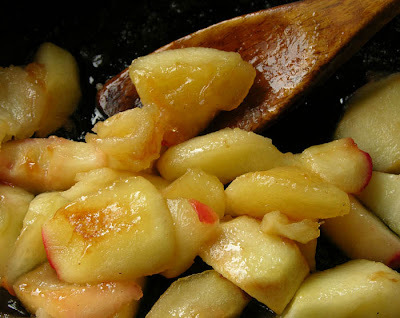 Spoon the cooked apples on the pastry, fold it over and brush the edges with beaten egg.